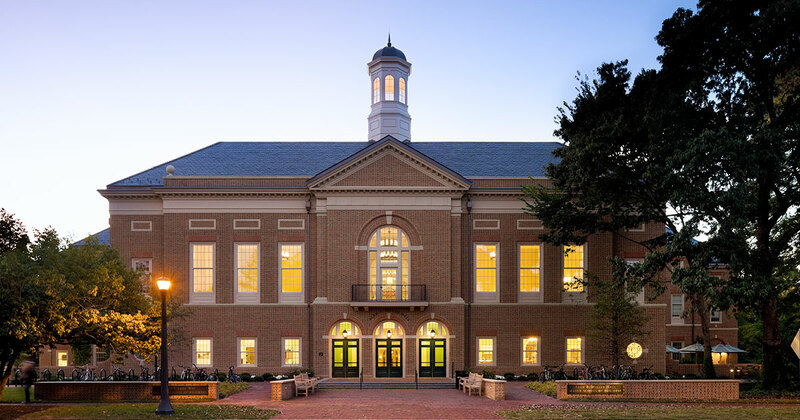 As 79 graduate students at the Raymond A. Mason School of Business at William & Mary were inducted into the worldwide honor society for business education, they were urged not only to continue their hard work but also to take a similarly rigorous approach to themselves and their careers. “Once you get out in the workforce and establish a career path, make sure you periodically take stock of what you’re doing—just so you can ask yourself why you’re there,” said Patrick Martin, managing director and head of the strategic advisory group for BB&T Capital Markets in Richmond, Va., who spoke to the inductees of Beta Gamma Sigma. Martin, who holds a Bachelor’s Degree in Business Administration and an MBA from the Mason School, particularly stressed one piece of advice: like what you do, and like with whom you do it. Otherwise, find something new. The 79 graduate students have distinguished themselves through outstanding performance and achievement in the study of business and management while at the Mason School. They rank in the top 20 percent of their graduating class. Founded in 1907, Beta Gamma Sigma is a global network of more than 830,000 lifetime “Best in Business” members. The scholastic honor society is dedicated to principles and ideals it considers essential to living a worthy life and pursuing a commendable business career. It connects students from more than 580 collegiate chapters worldwide. William & Mary’s chapter was formed in 1973 and has recognized more than 2,100 graduate and undergraduate students. The honorees, along with their friends and families, sat in the pews of the historic Wren Building while professors and guest speakers sat behind the podium. Soft sunlight filtered through the tall windows and shone on the dark wood inside. A hush fell over the room as William Stauffer, Clinical Associate Professor and faculty advisor of Beta Gamma Sigma, stepped up to begin the ceremony. Three professors, James Bradley, Alexander Woods and Debra Hewitt, explained the meaning behind the letters of Beta Gamma Sigma: Beta signifies honor, Gamma stands for wisdom, and Sigma represents earnestness. The importance of the induction and the event were not lost on the students. “Any ceremony in the Wren Building is magical,” said Elizabeth Fleming, who is pursuing her MBA. Brandon Posner, who is pursuing a Master of Accounting Degree, said it was refreshing to hear Martin’s admonition to turn a focus on self and career—and to be willing to make a change if necessary.